On a cookie sheet, lightly drizzle some olive oil onto aluminum foil. 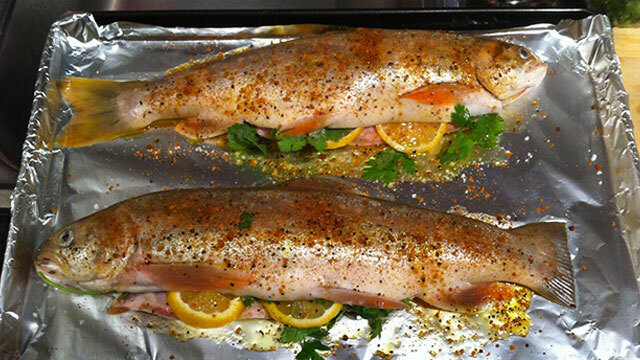 Rinse two medium whole trout with water; pat dry with paper towel. Drizzle some olive oil on the outside of the fish and season the cavity with salt, pepper, and PC Fish Seasoning powder. Add lemon slices inside the cavity and some fresh parsley. Bake at 375 degrees for 30 minutes and check for doneness. Add more time if needed.